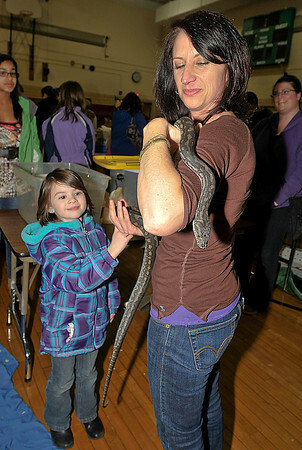 James Neiss/staff photographerNiagara Falls, NY - Who’s afraid of an Australian Carpet Python? Not little Piper Penny, 5 of Lewiston and Carolyn Zito, a teachers Aid at the Lewiston - Porter Intermediate Education Center. Zito was handling the snake for a friend who brought it to the sixth annual Save-A-Pet Art Gallery show and fund raiser for the local chapter of the Save-A-Pet organization at the Intermediate Education Center.